John Ethan Wayne (yes, The Duke's son) stars as a nameless young man wrongfully convicted of stealing several horses from a powerful area rancher (Ernest Borgnine). While beginning to serve an eighteen-month sentence, his stoic demeanor raises the ire of the prison administrator (Henry Silva) and soon "Stranger" is put through laborious endurance tests in an attempt to break his will. Seeing a chance to escape, Stranger breaks free to clear his name by finding the man who originally sold him those damned horses. It's easy to imagine the thought process behind the creation of Fabrizio De Angelis's The Manhunt. John Wayne was and still is immensely popular, so marketing an action movie with a Western tang starring one of actor's sons seems like a no-brainer gimmick for the '80s Italian film gristmill to capitalize on. 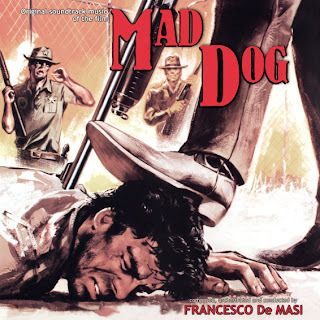 Snap in a simplistic man-on-the-run story probably written over two days by De Angelis and prolific genre writer Dardano Sacchetti and you've got yourself something many will see merely out of curiosity. For extra insurance, support the inexperienced lead with recognizable character actors like Borgnine, Silva, Bo Svenson (a sheriff in a handful of scenes), and fallen German-born tough guy Raimund Harmstorf. Unfortunately, the most exciting thing about watching The Manhunt last night was when my usually trusty Sony VCR nearly destroyed the tape from a flaky Eject. That's not to say this one's necessarily "bad" in a traditional sense. Fabrizio De Angelis, a.k.a. Larry Ludman, helped produce a litany of Italian horror and cult greats (including those at Lucio Fulci's peak), but his smaller directorial career is typified as being an also-ran. His films are rather even-keeled, neither as hackish as something from Bruno Mattei or as durable and in flashes exciting as Enzo G. Castellari's efforts at this time. So yeah, this is just another cheap decent action flick with a couple tepid chase scenes, a lead that totally lacks charisma, and some funny loops in its logic. Like when our protagonist blasts a double barrel at cops while fleeing in a prison bus only to shout down an ex-imate friend for shooting at them in a later chase. Or how the shooter in the police helicopter never aims for the tires on the bus. Or how Stranger can be ran to the point of exhaustion in blazing desert heat for the kicks of prison staff only to escape later that night by running some thirty miles to civilization. Or how Stranger can get off scot-free upon finding the horse dealer even after the attempted murder of several officers and endangering innocent lives in reckless car chases. Also funny how at one point, Stranger provides his phone number, the 1982 Tommy Tutone chart-topper 867-5309. Released by MEDIA on home video in North America, the Japanese VHS from Pack-In Video for this review is the uncut English version properly framed at 1.85:1 widescreen. The print is nice and bright, but unless you're a freak like me, it's much easier to just track down the U.S. tape if you're still interested. Ethan Wayne went on to be a cast member of De Angelis's better Vietnam brawler Cobra Mission (1986) along side Christopher Connelly, Gordon Mitchell, and Donald Pleasence.